Dogs4Us is a puppy warehouse. It has branches in Leeds and Manchester. Dogs4Us was exposed in 2009 buying puppies from puppy mills and telling a customer who’s puppy became sick to ‘take it back for a refund’ as treating the puppy would cost too much! In 2016 Dogs4Us was again exposed on national television. BBC Panorama exposed Dogs4Us selling puppies from cruel puppy farms, buying puppies under 8 weeks old, selling fake Pedigree dogs and selling seriously ill dogs to the public. The government says you should never buy a puppy unless you can see the mother with the puppy. 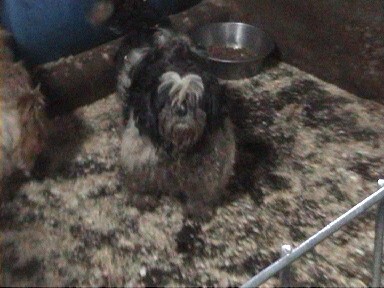 This is not possible at Dogs4Us as the mother is lock inside a puppy farm miles away. Dogs4Us won’t reveal their suppliers but the media has exposed them sourcing sick puppies from Wales/Northern Ireland and this is confirmed by the information that continues to be received by campaigners. With unwanted dogs being taken into shelters everyday we don’t think any breeding of animals can be responsible. Shelters are packed with puppies of all breeds that are microchipped, vaccinated and well socialised. Despite being of a better standard of health and suitability than the puppies in Dogs4Us they can be adopted for a fraction of the price. It’s not just the puppies that are treated badly. I recently adopted a kitten from dogs4us in Manchester as they said they were giving him away as he had a deformed ribcage. There was no care for him and they were very dismissive of my worries about his health. In his room there wasnt enough food or water or objects to entertain him. He had his brother with him which they were selling for £35. I took kenny straight to the vet and she was shocked at how ill he was. He was dehydrated and extremely underweight. When she gave him some food he went wild and ate so much so fast he was sick. He had also had diarrhoea another reason he was so unwell. She gave him fluids and requested to see him the day after free of charge as she was so worried. All in all I have had the cat for 3 days and he has already had 2 lots of antibiotics, 2 lots of fluids and 3 vet health checks. He doesnt know how to care for himself , clean himself or play – a sign he was takeb from His mother far too young. Even if he was free you still don’t expect an animal specialist to give away An animal who is so unwell without disclosing this to the adopter and without advising the care he will need. I think its disgusting that UK society has stooped as low as to promote and support animal abuse. These sores/warehouses MUST be closed down. I bought my beautiful little cockerspaniel girl from here, she’s always been very odd, she has lacated patella in her front legs, a heart murmer and hip displacer in both her back legs, she is frightened to death of everything, and pees if a stranger even stokes her. the vet wanted to put her to sleep but I wouldn’t let him, she’s our baby and we love her to bits, but god only knows what she’s been through. Ive had cocker spaniels all my life and I love them. Cocker puppies shouldnt be like this at all but she is your darling probably; ripped from her poor sick mother too early. They are the best dogs in the world I think. Just visited this place today nearly bought a poochon but after phoning a vet about vaccines was told not to touch this place with a barge pole lots of dogs have been there with problems and after checking reviews etc I feel so sad for these dogs they did have no food or water and did all look so sad.I can’t believe I nearly wasted over £500 but sad I couldn’t save one or all those poor little dogs. It’s so terrible isn’t it Irene I bought my poochon from a private seller who had 4 puppies ,I do think about that place and feel so sorry for those dogs in that place . I bought a German Shepherd puppy from them after our other one died. He was all alone in a pen and my heart went out to him. At 9 months old he was diagnosed with Hip Dysplasia and had to go through a very painful operation which was not guaranteed to work. I made the decision to have the operation as he deserved every opportunity we could give him. I went back to the Manchester based branch and wanted to know about his parentage as I did not want them to breed anymore pups as the condition is passed on from the parents. After my complaint which I must say was quite an angry one they offered to refund the money of the dog if I handed him back to them. How heartless was that he was part of the family…Luckily the operation freed him from pain, he does walk funny and has a bent back but he is still beautiful. As a family we have had to work really hard for him to overcome his separation anxiety and teach him to be respectful as he was separated from his Mum too early and was isolated on his own until we got him at 12 weeks old. I was silly to get him from there and I have to admit my heart ruled my head as I had heard bad reports about them.